What to do when you have writers block? Don Draper goes to matinee movies to beat his creative blues. So you ignore the silent, passive aggressive of an empty Word doc and grab (another) coffee, check Twitter, Facebook or Instagram (again). But writer’s block is still all you see. Well, those photos of cats that act like humans, Reddit lists of internet pranks, and wait, OMG – is that a video of otters playing the piano – OK, you get the picture. Writer’s block? I am so over it. I find that organizing my To Do list helps me refocus. This is when I get super specific and write action items to get the task done. Sometimes I discover that one task needs its own To Do list. It’s easy to fall into the routine of sitting at your desk, staring all day at the products or service you market on a screen. Take a look at it being used in real life, find consumers to talk about it with. Ask people questions. Tweet, Instagram and Facebook your experience and interactions. Reach out to a colleague or manager and simply say that you would appreciate a new perspective or fresh pair of eyes on the project you’re stuck on. They’ll be flattered you reached out. Even this “branding brainstorm” can be a social media story too — we all know customers love a behind-the-scenes look into the products they love. I repeat, step away from your desk. Go for a walk or do your favorite yoga class. 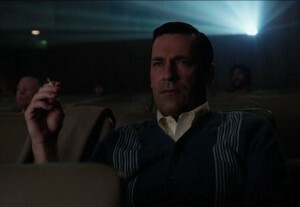 Don Draper goes to afternoon matinees. Do what you need to do to clear your head. Set up shop for the afternoon at a coffee shop, public library, or even leave your neighborhood completely to find a new spot to work from. Take in your new surroundings and find peace in a new environment. Sometimes when I get writers block, it’s because I either did too much or too little research. Go back to the editorial calendar, brand guidelines, or company mission statement to remind yourself what angle you need to focus on. Dip into your analytics to get ideas. Maybe you’ll notice new trends or something out of the ordinary to write about and research. Check referral traffic, maybe there is an untapped audience or niche you were unaware of. Is that intro bringing you down? Or can’t find the right photo for a story? That tagline makes you feel “meh?” Come back to it later. Work on a different part of the project and revisit it at a later date. If it’s a top priority, isolate yourself and don’t do anything else until it’s done. I’ll block out time on my calendar and put on headphones to block out everything around me. My colleague puts a sign on his door saying he’s working on a special project. My boss sometimes goes to the local library for a few hours. 10) Remember it’s OK to not be creative all the time. It happens to all of us. Being creative takes energy. Use this blah time to catch up on the uncreative parts of your job. Do any outstanding admin, clear out your email inbox, clean your office, organize paperwork, fill out expenses. You’ll find a clean up will put you back into the groove again. Writer’s block happens to all of us. What do you do to get out of a creative slump?